HUDSON MAXIM (1853-1927). An American inventor and brother of the gun inventor, Maxim was an explosives expert. (1853 – 1927), was a U.S. inventor and chemist who invented a variety of explosives, including smokeless gunpowder. He was the brother of Hiram Stevens Maxim, inventor of the Maxim gun and uncle of Hiram Percy Maxim, inventor of the Maxim Silencer. 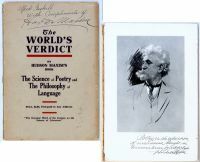 Soft cover edition of “The World’s Verdict on Hudson Maxim’s Book The Science of Poetry and The Philosophy of Language,” 43pp, 61/2" x 9 1/2", Fun & Wagnall’s company, New York . Promotional anthology of brief critiques of his book by 86 “well-known people” of the day. Frontispiece image with printed dedication and signature inserted. Boldly signed and inscribed on cover, “Alfred Gaskill With Compliments of...” cover separated; internally intact. General light toning; cover evidences light wear and soiling; 4" tear on back cover with no paper loss. Very Good. HUDSON MAXIM. TLS. 1pp. 8 1/2" x 11". Maxim Park, New Jersey. 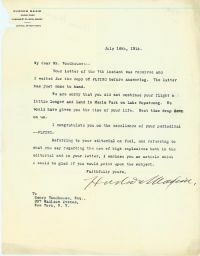 A typed letter signed "Hudson Maxim" to the well-known publisher "Henry Woodhouse": "Your letter of the 7th instant was received and I waited for the copy of FLYING before answering. The latter has just come to hand. We are sorry that you did not continue your flight a little longer and land in Maxim Park on Lake Hopatcong. We would have given you the time of your life. Next time drop down on us. I congratulate you on the excellence of your periodical - FLYING. Referring to your editorial on fuel, and referring to what you say regarding the use of high explosives both in the editorial and in your letter, I enclose you an article which I would be glad if you would print upon the subject." The signature is very dark and the piece is in extremely fine condition. A small chip to the upper left corner affects nothing.